Being that my car already measures velocity & position, why not fill the void with an accelerometer & measure acceleration? 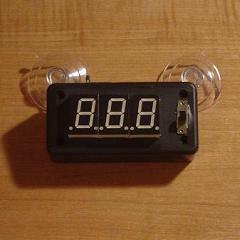 The Personal G-Force Meter Does just that using standard 7-Segment LEDs for output. Check out the video for an overview of how it works! where does the capaciter and other parts get wire at. They are wire-wrapped on and connected into SIPs. Checkout the Parts & Hardware sections of the write up to see pictures & how it is done. I’m hoping to have the next project up before the end of May. What do you mean by an audio VU meter? Make a post in the forums for project suggestions. Thanks! This is an awesome device. I am a 11th class student and i am looking forward to make it as soon as i get time.